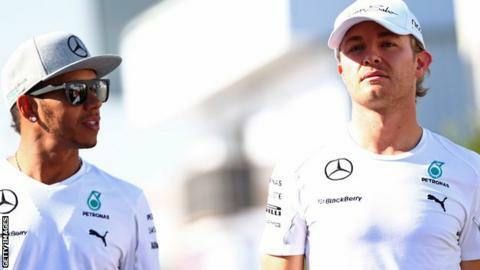 Lewis Hamilton and Nico Rosberg will be a mix of emotions following the Hungarian Grand Prix as they head into the four-week summer break with an eight-race championship showdown to come. Rosberg would have gone into the race from pole position thinking it should be a straightforward victory. Hamilton, starting from the pit lane, would have thought a top-five finish was the best he could hope for. So the way it played out, with Hamilton finishing third and fending off Rosberg's attacks on the last lap, would have been a surprise and a disappointment to Nico. While for Lewis, all the ingredients were there for him to be jumping around and thinking it was a great race. Of course, that's not what Hamilton was doing, and the reason he did not look happy was that in the final third of the race - trying to make the harder tyre last to the end - he was asked to move over for his team-mate. As I said in commentary, you either give a directive, or you don't say anything. And a directive has to come from a senior member of the team management - in this case, Paddy Lowe or Toto Wolff. Asking an engineer to tell his driver to move out of the way of a man he is fighting for the championship in the same car is always difficult because that bond of trust between a driver and his engineer is super-important. As it happens, I don't think this is as big a story as it will get blown into because the team were just thinking about having both cars run their best strategies and then see where they were at the end. But that is to forget the emotion that goes into that sort of race. Drivers are exhausted after a wet race, not physically but mentally, because the concentration required to get it right is immense. It will have been uncomfortable for Mercedes to have to field the media, and those who have an agenda will inevitably try to create some sort of conspiracy theory. But the only question they need to answer is whether the engineer was given an advisory by a team boss or whether he took it upon himself given previous team agreements. The message did not come across that well, and it has left both drivers feeling uncomfortable. But I think it was said in a sincere way - ie, don't waste your tyres trying to defend. I suspect they felt Hamilton was on a strategy that would comfortably beat Rosberg. As it turned out, we saw how close Rosberg did come to getting ahead. Ultimately, the winner is F1, after a great race, with crashes with drivers walking away, fabulous battles down the field and at least three drivers who put in fantastic performances. If Fernando Alonso, Hamilton or Daniel Ricciardo had won that race, any one of them would have deserved it. Ricciardo did so in the end, and his stock just keeps on rising. Hamilton's emotional rollercoaster of a season continues and what more praise can we give Alonso, the man who will never give up? Rosberg may feel he should have been the guy winning, but in the end they made their calls on strategy and it did not work out. There were a lot of great stories and I don't think it should be overshadowed by something that the tabloids will make a big deal out of, but which ultimately will blow over. I'm sure there are a number of things Mercedes will do differently in the future but the end of the story is the management did not interfere, they allowed them to race and we have a fascinating end to the season in store. What next for Hamilton and Rosberg? There are eight races to go and it's very hard to call the battle between Hamilton and Rosberg. Some things are clear, though. In the two wheel-to-wheel battles they have had so far - in Bahrain in April and on the last lap in Hungary - Hamilton has come out in front. Rosberg tried on the last lap to do what Ricciardo had done to Hamilton three laps earlier, but Hamilton had enough of his car in front to hold him off and Rosberg had no choice but to back off. In racing terms, Rosberg has all the hallmarks of a professional, very slick, more than worthy champion-elect. But Hamilton is a street fighter and instinctive racer and Rosberg has yet to prove he can beat him in a straight on-track fight. If you had to mark the two Mercedes drivers, they are very close. Hamilton has the slight upper hand in pace and in racing combat. But Rosberg has been soaking up the pressure unbelievably well through the ebbs and flows of the first 11 races of the season. He is less emotional, and less reactive, even if there were signs of frustration in his voice in the radio transmissions in Budapest. But Rosberg does not have that been-there, done-that knowledge that Hamilton has when it comes to handling a championship battle over a season. That is still evolving for Rosberg. In Hungary, he was thinking: "If Lewis is slow, why is he not moving out of the way?" Well, Nico, he's not moving out of the way because he is trying to beat you to the world championship. So while Rosberg is seeing the big picture of the responsibilities inherent in racing for Mercedes, he needs to realise that he has to win that title on the track. Hamilton can look back on some self-inflicted wounds - as well as greater misfortune when it comes to reliability - while Rosberg is probably licking his racing wounds somewhat. But at past the halfway point of the season, Rosberg is leading the championship on merit. Hamilton is not the first man to have had reliability issues. Many drivers with more titles than him have had horrible seasons of unreliability and that is just the way it goes. We are poised for a fascinating second half of the season and either one of them can do it. For those of us merely watching, it is brilliant, because we can feel the pressure pot boiling and the sense is that they both need this four-week break to recharge their batteries. Can Mercedes control their drivers?